We invite you to join us at Bais Yaakov Elementary School on Tuesday, March 12, 2019 at 8:00 pm where Rabbi Noach Isaac Oelbaum, IY"H, will inspire us. 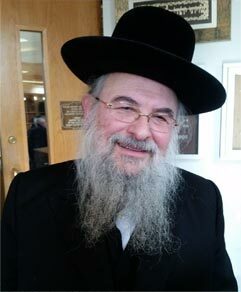 Rabbi Noach Isaac Oelbaum has been Mara d'Asra of Khal Nachlas Yitzchok in Kew Garden Hills for the past 44 years. Rabbi Oelbaum continues to exert a profound influence on an entire generation with his deep avodas Hashem. The renowned author of many sefarim on sugios of Shas, Rambam - Hilchos Teshuvah and the Haggdah, Rabbi Oelbaum reaches out to people around the world as a maggid shiur on Dial-a-Daf and Dial-a-Shiur and is a public speaker in high demand. His Torah lectures can be heard on Torah Anytime and Kol haLoshon. Despite his grueling schedule, Rabbi Oelbaum still finds time to lead his kehillah with remarkable care and energy. The Rav's family settled in Toronto and opened a shul. Rabbi Oelbaum went to cheder at Shlomei Emunei Yisroel, led by the Tetcher Rav ztz"l. Later it became Yesodei HaTorah. For yeshivah, his father sent him to Nitra, the yeshivah established by Rav Michoel Ber Weissmandl in Westchester, New York. While learning in Nitra, the Rav completed the rigorous smichah program and moved to Williamsburg, learning in the Chasan Sofer kollel. The Annual Tomchei Shabbos Lecture is dedicated in memory of Ruchama Fraidel Zlotnick a"h who was tragically taken on 21 Adar 5759. The Yom Tov clothing and footwear is dedicated in memory of Chana Malka Weissman a"h who taken from our midst over 10 years ago.